Hot Again Today - Cooler & Maybe Some Rain Thursday. Blog Updated @ 9:10 AM MDT. Leaf Peeping At Squam Lake, New Hampshire Oct 4, 2016. Temperatures @ 5 AM MDT This Morning. 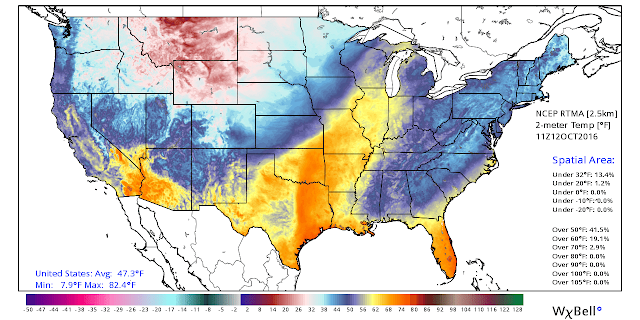 24-Hour Difference In Temperatures @ 5 AM MDT This Morning. Reported Low Temperatures This Morning. 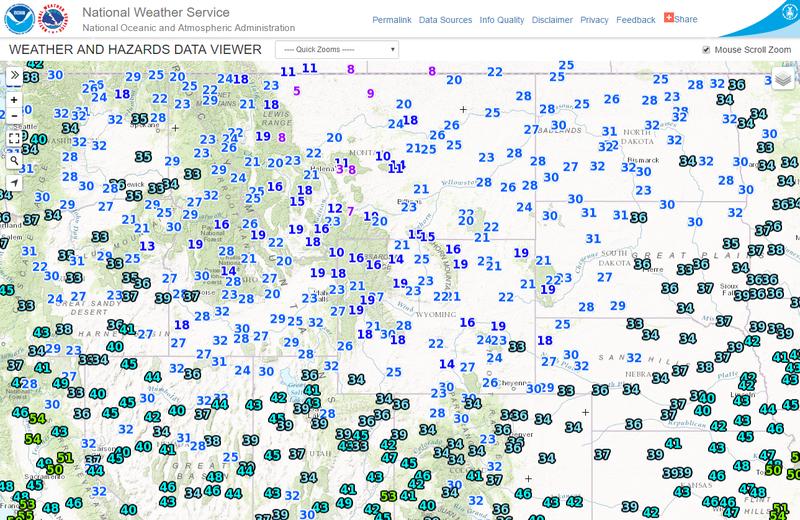 Note several locations in Montana have reported single digit temps for lows this morning. 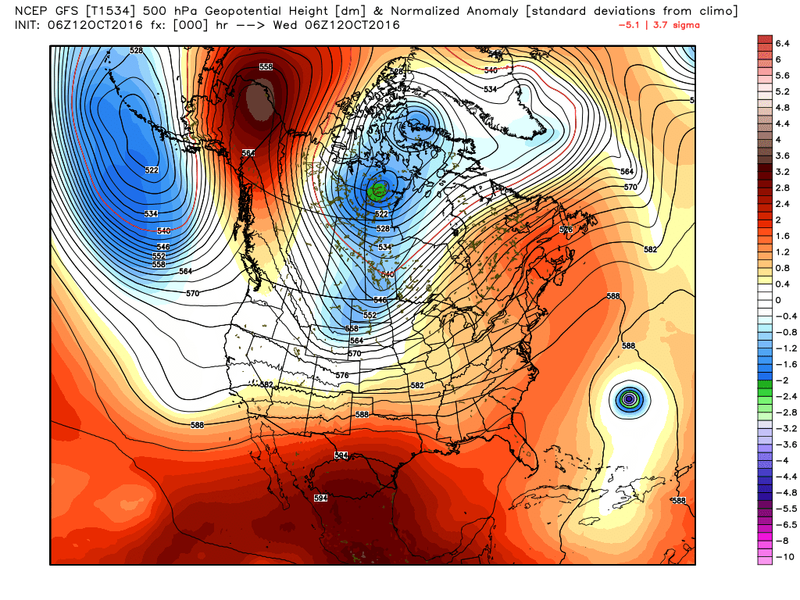 GFS 500 MB Analysis @ Midnight MDT Last Night. A fairly deep and cold upper level trough of low pressure is currently swinging eastward across the northern states this morning. The southern end of the trough (depicted above at the 18,000' level) will swing across northern New Mexico today and tonight. 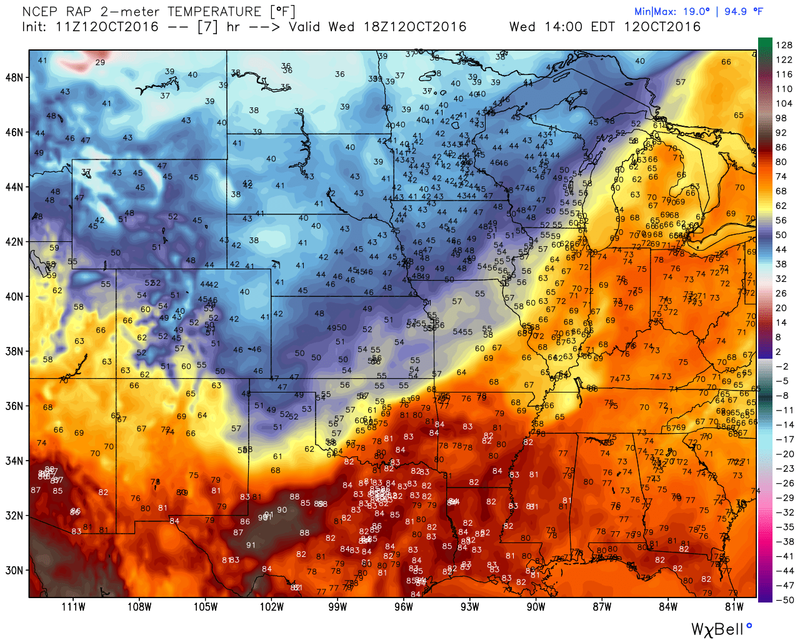 This will shove a southward moving cold front into southeastern New Mexico by around sunset this evening. RAP Forecast Temperatures @ Noon MDT. 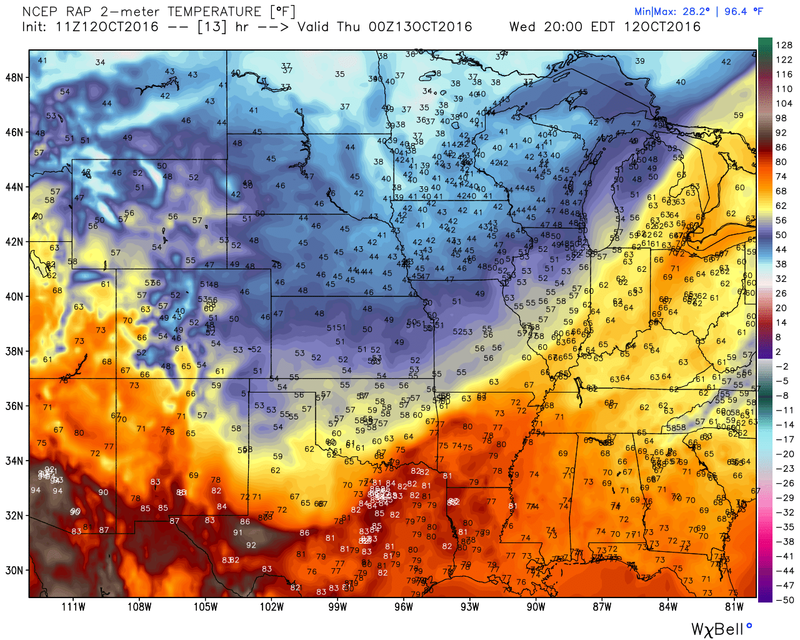 RAP Forecast Temperatures @ 6 PM MDT. 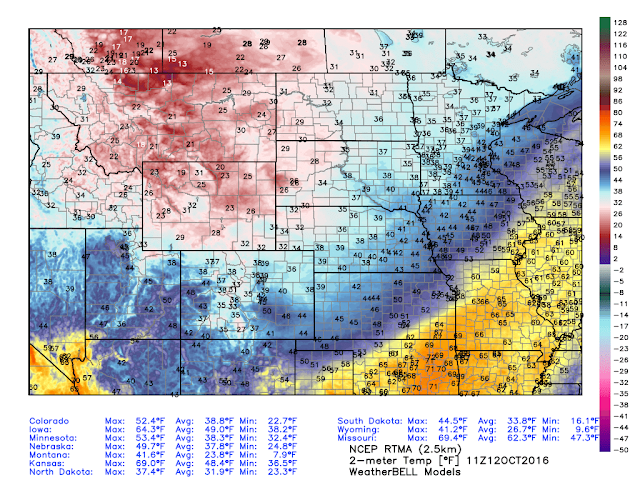 Southward Moving Cold Front Arrives Around Sunset. GFS Forecast Temperature Departures From Normal @ 6 PM MDT Today. High temperatures are forecast to climb up to the upper 80's to near 90 today in southeastern New Mexico. Highs in the mountains will range from near 70 in the Cloudcroft area to near 75 in the Mayhill and Ruidoso and Capitan areas. 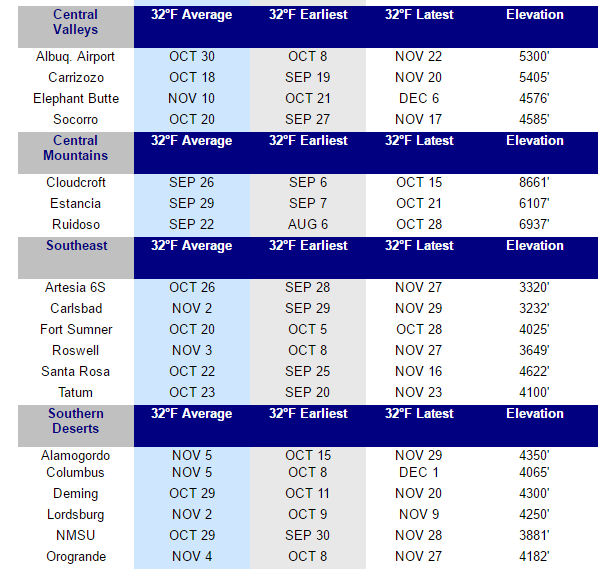 These readings are forecast to be some 10 to 15 degrees above normal for October 12th. 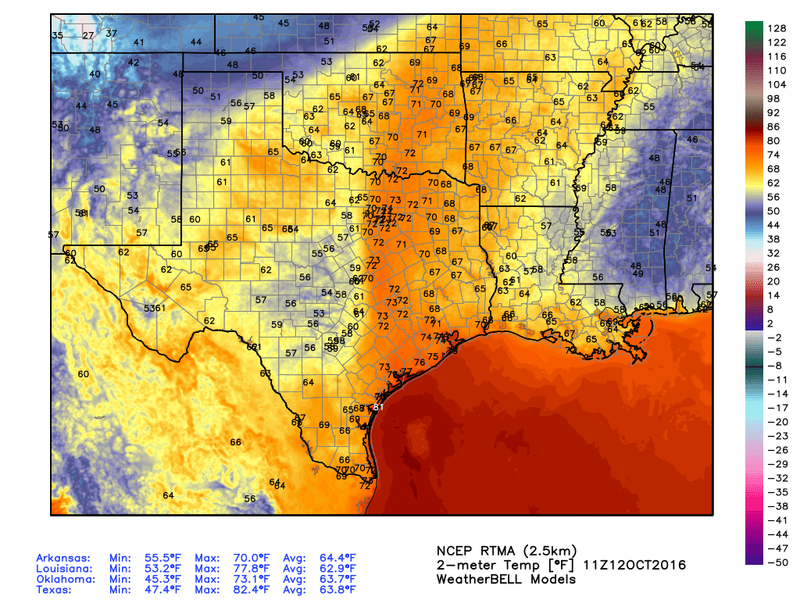 Highs on Thursday are forecast to be some 15 to 20 degrees cooler behind the cold front with readings near 70 across the southeastern plains and near 60 to 70 degrees in the mountains. Cold air is invading the northern states. 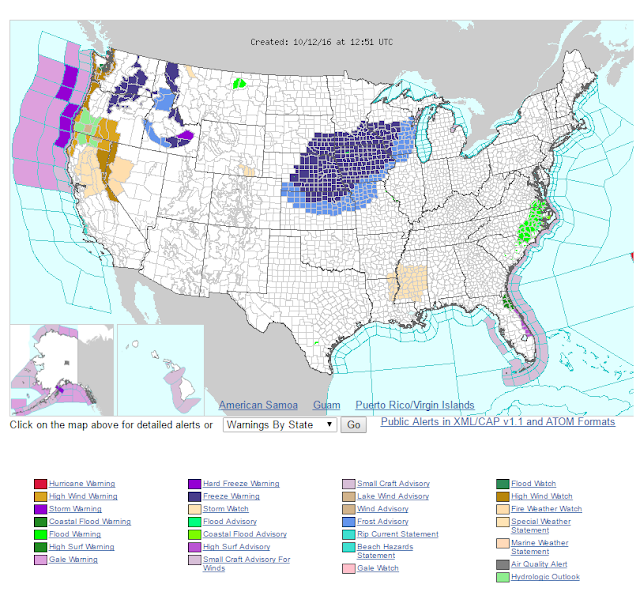 Frost Advisories and Freeze Warnings are in effect for Kansas, Nebraska, South Dakota, Minnesota, Wisconsin, Iowa, Oregon, Washington, and Idaho. Cooler moist low level upslope southeasterly flow behind the cold front and passing weak upper level disturbances passing overhead will combine to give us a slight chance for a few scattered rain showers and thunderstorms across southeastern New Mexico and the nearby Guadalupe, Sacramento, and Capitan mountains tonight into Thursday night. 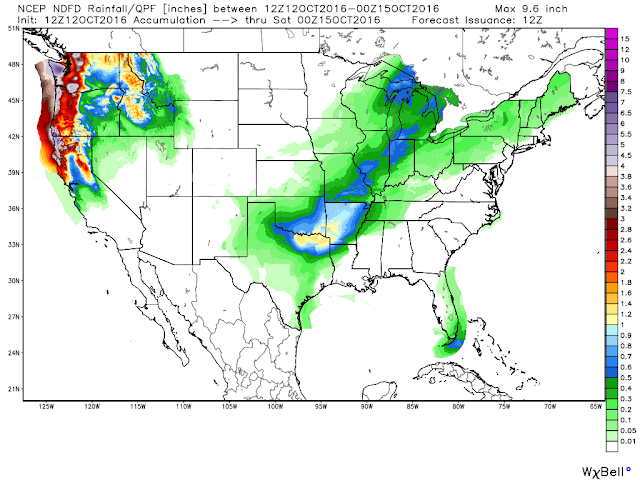 Overall rainfall totals are forecast to be under one half of an inch. Notice that snow is in the forecast for parts of the mountains of the Pacific Northwest into Wyoming, Montana, and Idaho. Winter is not that far away. 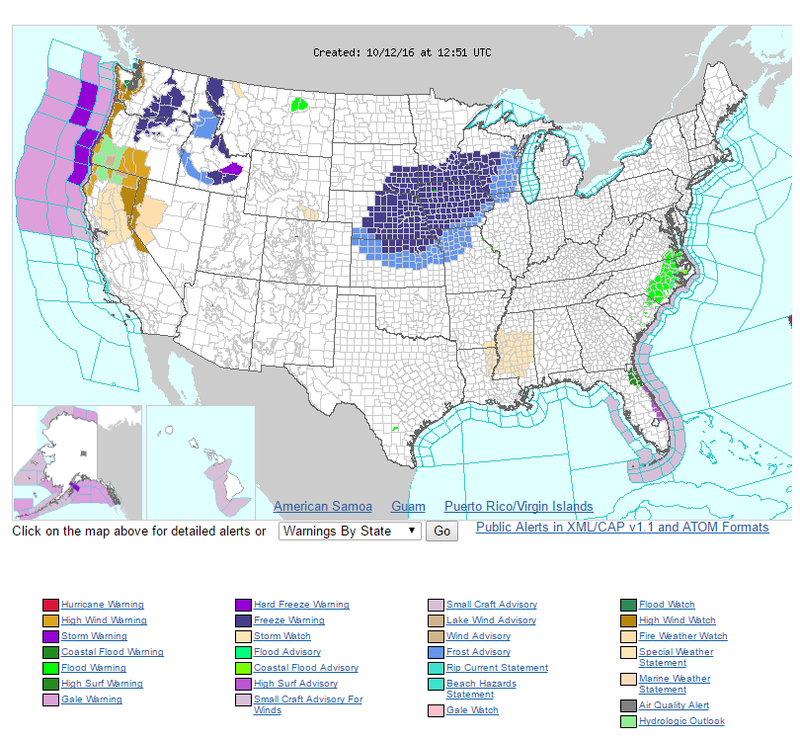 Heavy rains are forecast from northern California northward into Washington along the coast and mountains. 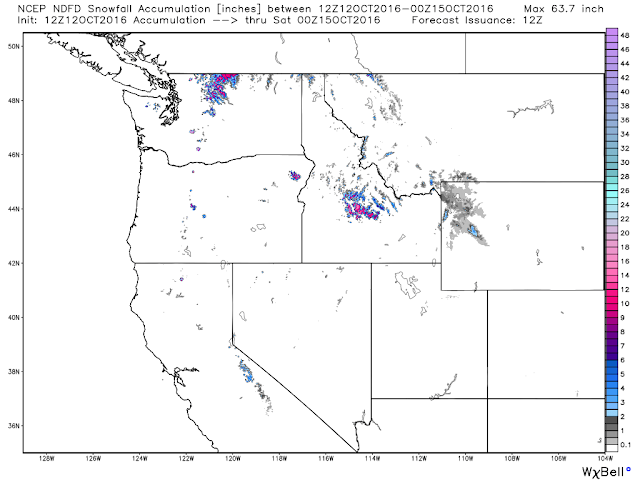 Some totals may approach 10" by Friday. 10-Day Forecast For Roswell, New Mexico. 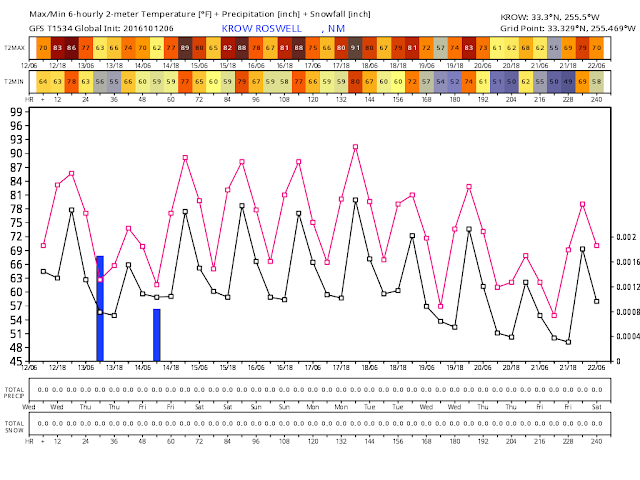 Long range forecasts for the local area generally keep our temperatures slightly above normal over the next ten days starting on Friday. 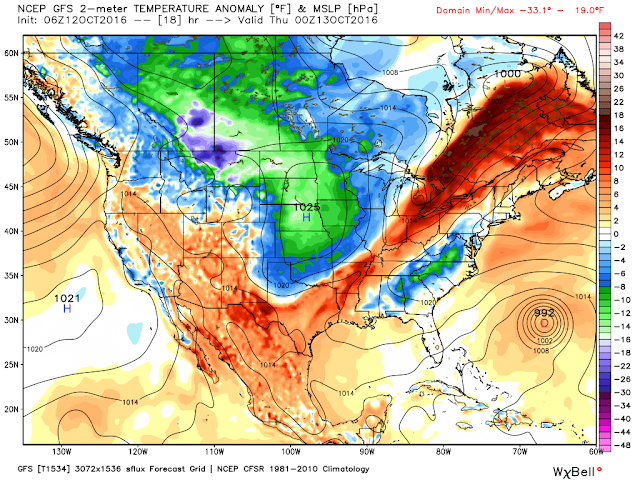 So for now there isn't any indications of a frost/freeze in our near future here in southeastern New Mexico. Rainfall Totals Jan - Sept 2016. Parts of New England and the Southeast continue to experience extreme drought conditions. 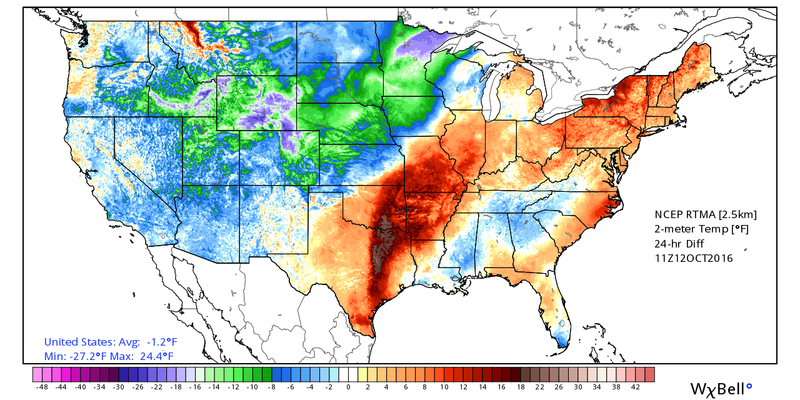 While parts of southeastern Texas and southern Louisiana are some 15" to nearly 20" above normal.